Our 2018 National Week of Prayer and Action begins today! Parish groups, schools, and Catholic organisations are registering their activities from all over the country. Thank you for all your hard work in spreading the word about the week and for organising your group, school or parish to pray and act. It is not to late to take action! Register today here. 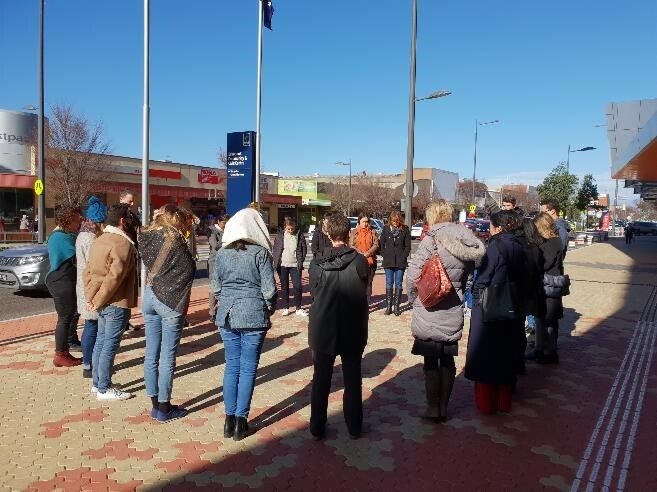 CAPSA is an alliance in the truest sense – a mixture of individuals, groups and organisations working towards living out Catholic social teaching and ensuring human dignity is upheld and respected for people seeking asylum. Thank you for being a part of it, and for your work and support. From 20 – 31 August join schools, parishes and organisations in our National Week of Prayer and Action. Gather your friends, colleagues, classmates, students and get involved in one of the many different activities. More information here. Last month CAPSA asked groups to organise 15 minute lunchtime ‘Circles of Silence’ to mourn the 5 year anniversary of mandatory offshore processing. Thanks to all who participated in acknowledging this anniversary. The Australasian Centre for Corporate Responsibility (ACCR) and the Refugee Advice and Casework Service (RACS) are calling on Qantas to stop the removal and deportation of refugees and asylum seekers to danger. ACCR is considering formal AGM action against Qantas, and is looking for Qantas shareholders to potentially co-file a shareholder resolution calling on Qantas to stop deportations and removals to danger. There is strong international precedent here. The risks involved in facilitating the deportation, transfer and removal of refugees and asylum seekers have been recognised by other airlines internationally. In June this year, Virgin Atlantic in the UK announced that it would end all involuntary deportations on their network from August 1, 2018. If you hold shares in Qantas and would like join ACCR’s shareholder resolution, you can sign up to the ACCR Resolutions database. The Australian Catholic Migrant and Refugee Office has organised the 8th Annual Bishop Joe Grech memorial colloquium during Migrant and Refugee week. This year’s colloquium is on the contribution of the Catholic Church to the Global Compacts. 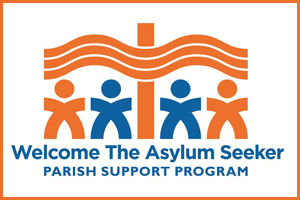 CAPSA asks that your diocese, parish, or group discuss and prayerfully consider how the Church responds to people seeking asylum, refugees, and migration more broadly. If you would be willing to share your thoughts or submissions to the Plenary Council with broader alliance members and supporters, please email them through to us. If information regarding people seeking asylum, refugee, or migration more broadly would be useful to your discussions, please contact us and we will get that information to you. 17,668 – is the number of people awaiting an outcome of their refugee application whilst living in Australia on a Bridging Visa E. This includes 2,956 children. Source: Department of Home Affairs. 29 – number of children in immigration detention, 22 located on Nauru and 5 on the Australian mainland. Source: Department of Home Affairs. 310 – people who were in detention on Manus Island or Nauru have been resettled in the US. Source: ABC News and The Guardian. 245 – people in detention on Nauru. Source: Department of Home Affairs. In addition to this approximately 750 refugees and asylum seekers are living in community on Nauru. Have you ever wondered how Australia is positioned globally on the issue of child immigration detention? Today, record amounts of people are migrating and seeking asylum, more than 50% are children. Worldwide, children are being detained and separated from their families. Join the expert panel on alternatives to immigration detention. Co-hosted by the End Child Detention Coalition and the Castan Centre for Human Rights Law. 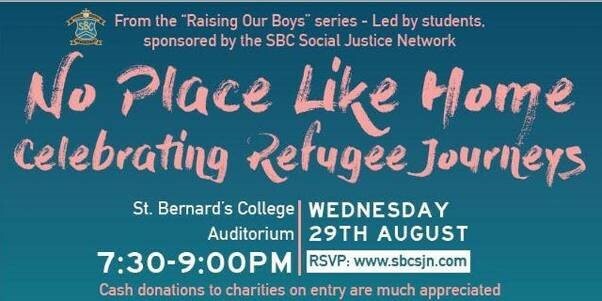 The SBCSJN (St. Bernard’s College Social Justice Network) is excited to be sponsoring what promises to be another inspirational and thought-provoking night for parents, boys and their families, as we celebrate the contributions of refugees and asylum seekers to our nation through hearing their stories.